"Looks like a new model but not the price of one!" 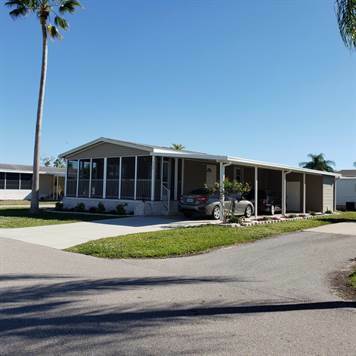 Beautiful 2/2 Manufactured home on a prime corner lot in Caribbean Park, a 55 and up age restricted community with lot rent of $625.00 per month. Lot rent includes water, sewer, garbage, yard mowing, and use of all amenities. This home is located on Sunshine Blvd., the main road into the community and very close to the clubhouse, pool, and other amenities. This 2015 home has many new upgrades including black stainless steel french door refrigerator with large freezer on the bottom, black glass top range with exceptionally clean and shiny stove top, moan kitchen sink water fixtures including a filtered sip faucet. The large open floor plan includes the dining room adjacent to the kitchen and open to the spacious living room. Down the hall is the master bedroom with two separate doors to the closet that reaches from wall to wall for plenty of closet space. The private master bathroom has a nice vanity with upgraded faucets and a walk in shower with upgraded shower head. The guest bedroom is across the hall with two separate closet doors which also reaches from wall to wall to provide a very spacious closet. The main/guest bathroom has a vanity with upgraded faucets and a shower/tub combination with upgraded shower head. Conveniently located in a closet in the hallway is a 2016 Hi-tech front load washer and dryer. In the front of the home through double sliding glass doors off the living room is a large 24 x 8 screened in and covered front porch with Trex decking. The oversized 8 x 13 flood resistant shed is located in the back of the carport. The long 65 foot driveway has plenty of room for three vehicles if needed and has a special stain on the cement for exceptionally easy cleaning. All the windows and the sliding glass are double pain and open inside for easy cleaning. The ceilings throughout the home are very high and have attractive crown molding. A new HVAC system was installed in 2017 and the 2018 clear storm shutters are available for all windows and slider. Home is built to Wind Zone 11 standards. This is like a brand new home without the brand new price! Call today for more information or to schedule an appointment to personally take a tour of the home. ▪ Great North Naples location. Minutes to beaches, restaurants, shopping, banks, movie theater, and more!